Posted on January 31, 2011 by Jill B. The USB album is poised to storm the music scene and a Norwegian dance-punk band with an infectious beat is currently leading the way. Spin Magazine reports that Norway’s Datarock, who has become a Coachella crowd pleaser over the last few years, is slated to release a one-of-a-kind single through a custom USB flash drive. Datarock—which is actually a Norwegian translation for the word “computer” ironically—was looking for a way to push the envelope with the debut of new tracks. The duo’s Frank Saroea says he “simply united the two things I had in my pocket”, which happened to be a toy and a flash drive. The outcome did not result in the innovation that Saroea had expected, but it unintentionally breathes new life into the way flash drives are used. At 4GB, the Datarock USB stick is packed with lots of music goodies, proving that a flash drive has a lot to offer in terms of what it can pack into one small device. You’ll get: 110 songs that include the band’s “The Catcher In The Rye” single, 20 music videos, one hour concert video and 1,500 photos. The USB music drive has perks within those features you’ll be hard pressed to find anywhere else like a 5-track EP, Datarock’s previous two albums, bonus tracks, b-sides, instrumental numbers and remixes. 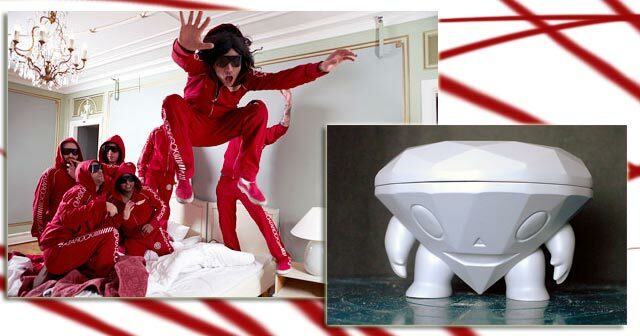 The custom music flash drive comes housed in a pearly white toy that looks like a faceted cartoon jewel sporting a face, arms and legs. Hybrid Design and SUPER 7 are the mad geniuses behind the creation of the toy. The flash drive by Datarock shows the evolution of music on USBs. Back in 2007, Nine Inch Nails promoted leaks of their Year Zero album on flash drives strategically placed at the band’s concert venues. Recently, a 16GB Beatles Stereo Box Set debuted on Amazon loaded with multiple albums. Lady Gaga rereleased The Fame Monster album on a USB stick last year and it sold out within 24 hours. The music flash drive concept is a positive milestone for the interface as well as the memory industry. It’s a way for musicians to take control of their artistry because they are not only providing a wealth of music, but exclusive content that you can’t easily download through online music file sharing. It’s exciting to think where USB albums will take us next—demand is there and they demonstrate the best way to customize the music experience for fans. Love or hate the USB album concept? We want to hear what you think! Would you buy one? This entry was posted in Articles, Datarock, USB Albums, USB Flash Drives, USB Music Flash Drive, USB Stick, USB Technology and tagged Custom USB flash drive, Datarock, Datarock USB album flash drive, Datarock USB stick, music on USBs, Spin Magazine, USB album, USB music drive. Bookmark the permalink.